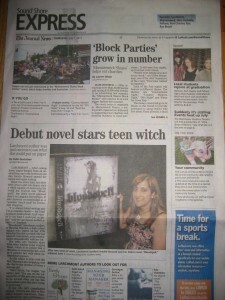 Bloodspell on Front Page of The Journal News – Sound Shore Express! Add The Journal News: Sound Shore Express to the list of terrific media coverage for Bloodspell, with a full feature article on the front page of the newspaper. On the back of the Seventeeen Magazine nod, this is just awesome! Just want to say a huge thanks to everyone who has read Bloodspell and recommended it to others. Your support is what drives me! And thanks also to my AMAZING publicity team at JKS Communications who work tirelessly to support me and this novel. 5 Comments on Bloodspell on Front Page of The Journal News – Sound Shore Express! I am so happy that they printed that in that paper! If not, I would not have realized to read this great book! That’s great Amalie. You deserve it. Love your website BTW so homey. Way to go Amalie! That’s awesome! I wish you oceans of success in your future endeavors! !